Exporter of a wide range of products which include desiccant hanging strip, super dry desiccant, dry container desiccant gel, clearance desiccant gel, container super dry gel and desiccant gel. We provide Desiccant Hanging Strip which are of 500 gram and are capable of absorbing 750 gm of water from air at any humidity levels. it can be laid on the top of the stuffed bags. This type is suitable for hygroscopic bagged goods stuffed inside the container like rice, wheat, coffee and where there is no space for hanging the desiccants. Low expenses compared to silica gel. Best Quality Desiccant Available with us. We can make customize Size and Weight as per requirement. Kindly provide chance to serve you in the better way. We are offering Super Dry Desiccant to our clients. For this situation, the solution is the DRY Container Desiccant Gel which is used to control moisture from shipping containers, transport vehicles and train. It protects all kind of food, agriculture, shipping, leather, metal and many more products from damaging effects due to moisture. Our container desiccants are USFDA approved and can absorb up to 100% of its density in moisture, and protect products from moisture for more than 50 days and keep dry and safe. Sorbead India is the global supplier of container desiccant packs which can be used for shipping products worldwide without having risk of reducing dew point, mold progression or moisture effect. 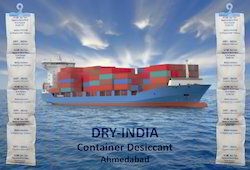 These dry container desiccants are totally non-toxic and can be disposed easily without any harmful effects on the shipment stores. This makes them ideal for food products which are produced and transported in containers around the world. In shipping container moisture problem is often creates products damages, causing the occurrence known as "container rain". From the shipping container if moisture is not controlled in proper way there is may be increase mold, mildew, sweating, corrosion, rust and moisture itself. All of these, increasing the risk of loss while during export sailing vessels for various commodities product travels during sea expeditions. Container desiccant packs are fill with clay inside, offers a 100% protection during such shipments & voyage, where any critical products loaded can be saved from losses & damages arises from humidity & moisture attacks. 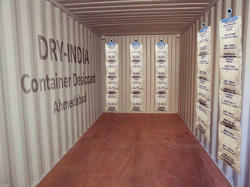 Container Desiccant Gel - A premium drying desiccant which is manufactured by Desiccare Inc. USA. Customers can now ship their products with total confidence as absorb moisture up to 100% of its weight. Our desiccant bags are non-toxic substance and do not impact on food, drugs, medicines and other products which are directly used by people. Desiccant bags are readily available in 500 gram packs and 1500 grams packs which are bulk packed for consumer use. Container desiccants packs are filling with bentonite clay and calcined clay. Cargo dry paks are also available in Mix type bags in 200, 500, 1000 & 1500 grams, which can take up almost 50% of moisture & humidity of its own weight. We are leading supplier of Clearance Gel (Hanging Desiccant Gel). Normally the accurate calculation for requirement of the Desiccant is difficult, because of the various factors like climatic conditions, hygroscopicity of stuffing goods, Transit duration, climatic and temperature variations while sailing in sea etc. But normally we recommend 2 - 4 kgs for a 20 foot Container Dry Cargo with Moisture content of the goods less than 10% and transit time 10 Days. If moisture content is more than 10 % we recommend 6- 10 kgs. You can also increase or decrease of the quantity of desiccants as per your needs. Using more number of desiccants will give a good protection from condensation. We are offering Container Super Dry Gel to our clients. We are offering Desiccant Gel to our clients. We are offering Moisture Proof Desiccant Gel to our clients. We manufacture Moisture Absorbent Gel capable of absorbing 1500 gm of water from air at any humidity levels. This can be easily hang inside the walls of the containers and suitable for all cargoes. Hanging desiccant strip is most favored solution for moisture control. It has been broadly utilized in sea transporting containers with unmistakable impact to resist dampness & eliminating condensation to recover products from rust and erosion while products are in travel because of high humidity. Desiccants are manufactured specially to suit our customer needs and their requirements. Desiccants are available in a wide range with international challenged quality and a very high rate of Absorbtion. Desiccants are available in various forms from 10 gms packets to 2 kg bags which will suit the customer requirements.